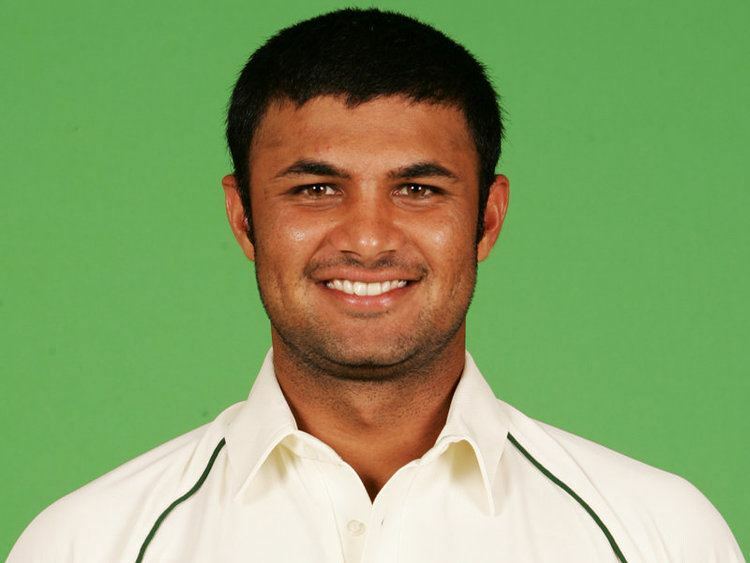 Imran Farhat (Urdu: عمران فرحت‎, born 20 May 1982) is a Pakistani cricketer who has played 40 Tests and One Day Internationals for Pakistan, opening the batting in most of his international innings. Farhat made his senior debut aged 15 in a one-day match for Karachi City against Malaysia, together with three other players who went on to play Test cricket (Taufeeq Umar, Bazid Khan and Kamran Akmal). Three years later, in February 2001, Farhat made his One Day International debut, against New Zealand in Auckland, scoring 20 runs in a chase of 150 to win. After the tour of New Zealand, where Farhat played three Tests and three ODIs, he was sent back to domestic cricket before returning against Australia in the third Test of the 2002–03 series, where he made 30 and 22 in an innings defeat. However, he was retained for the home two-Test series against South Africa in 2003–04, where he scored 235 runs including a maiden Test century in a 1–0 series win, second behind fellow opener Taufeeq Umar. A month later, Farhat played in an ODI-only series against New Zealand, which Pakistan won 5–0, and Farhat made three fifties along with his second international century, ending with 348 runs at a batting average of 69.60, once again the second-highest amount of runs – this time behind Yasir Hameed. The season was rounded off with another century, this time against India, where he made 101 to help Pakistan gain a 202-run first-innings lead and eventually won the match by nine wickets. However, Farhat tallied 81 runs in the other two matches, which Pakistan lost to lose the series 1–2. Farhat was less impressive the following season, however, and in four Tests, two against Sri Lanka and two against Australia, he only passed fifty twice, ending the season with 199 runs at 24.87 before the selectors left him out for the third Test of the series with Australia. In September 2004, just before the 2004–2005 season, he had been dropped from the ODI side following the 2004 Champions Trophy, as he had failed to pass 40 with any of his last ten innings, and that included 38 not out against the non-Test nation of Kenya, 20 against ODI debutants Hong Kong and 24 against Bangladesh. He continued to score heavily in the domestic competitions and a century in a practise game against the visiting Indian team was rewarded with a place in the squad to take on India in the Test series (2006). He returned to Test cricket in style, with an important half century in the deciding third Test at Karachi. He scored a brilliant unbeaten century in the final test against New Zealand in 2009. His brother Humayun Farhat has also played International cricket for Pakistan.He is the son in law of once Pakistan batsman Mohammad Ilyas.